ZURICH (Reuters) - Credit Suisse's chief executive will hit back at allegations the Swiss bank was a willing accomplice in U.S. tax evasion on Wednesday, blaming instead a small group of its private bankers for helping Americans conceal their wealth. Brady Dougan will tell U.S. senators that Credit Suisse only uncovered "scattered evidence" of improper conduct, and its top managers were not aware that a small group of Swiss-based private bankers helped U.S. customers hide income and assets. "We deeply regret that - despite the industry-leading compliance measures we have put in place - before 2009, some Credit Suisse private bankers appear to have violated U.S. law," Dougan said in prepared remarks, released before his appearance later on Wednesday in front of a U.S. Senate subcommittee on offshore tax evasion. "The evidence showed that some Swiss-based private bankers went to great lengths to disguise their bad conduct from Credit Suisse executive management." Credit Suisse has been accused by U.S. senators of helping American customers dodge taxes with a variety of tactics, including creating offshore shell entities, falsifying visa applications and establishing a branch at Zurich airport, where wealthy U.S. clients could fly in, conduct their banking and leave. One Credit Suisse banker even handed account statements to a client tucked inside a Sports Illustrated magazine, according to a scathing report released by the Senate Permanent Subcommittee on Investigations on Tuesday. In his testimony, Dougan disputes some of the methods used and some of the finding of the Senate report, saying the subcommittee improperly assumed every U.S. client account held in Switzerland was hidden from the U.S. government. The report said that in 2006, Credit Suisse held 22,000 accounts from U.S. customers worth 12 billion Swiss francs ($13.5 billion). Switzerland's private banking model has been rattled to its core by the U.S. crackdown on tax evasion. Credit Suisse's arch-rival UBS admitted to helping U.S. taxpayers hide money from the tax man and paid a $780 million fine in 2009. Evidence culled from the UBS probe as well as thousands of Americans coming forward under a tax amnesty in the United States has fed a second wave of investigation, which has ensnared Credit Suisse and 13 other large Swiss banks. Credit Suisse shares were down 2 percent in Zurich. "The market is very focused on the recent news flow and jittery over the CEO's testimony to the Senate later today. He's probably in for a rough ride as the U.S. politicians clamor to score points," said Mike Ingram, analyst at BGC Partners. Dougan said the bank had implemented a raft of new policies, including requiring U.S. customers to prove tax compliance and tightening U.S. travel policy for its Swiss-based private bankers. He also said Credit Suisse had cooperated with U.S. authorities as fully as possible under Swiss law and had supported transparency efforts such as the Foreign Account Compliance Act in the United States. 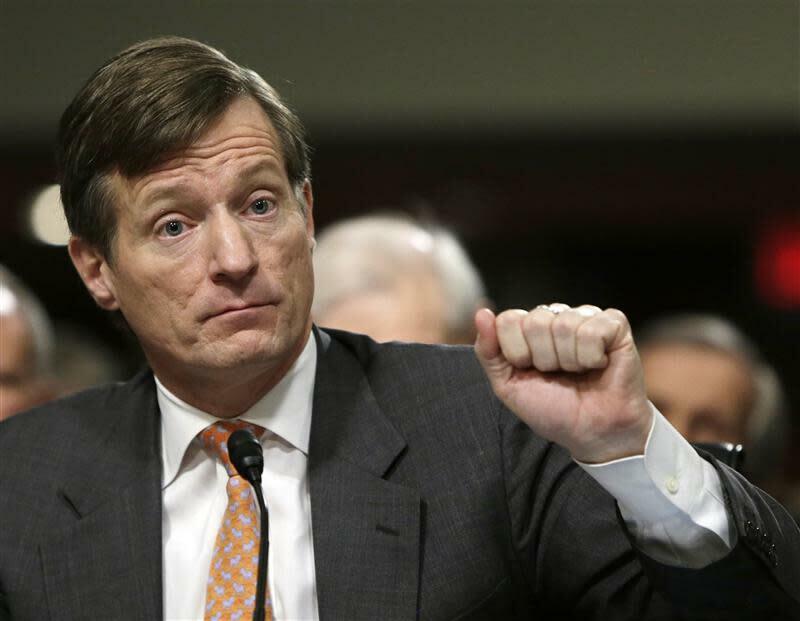 Dougan said Credit Suisse had come in for harsh criticism at home for its cooperation with U.S. authorities. "We are fighting Swiss lawsuits trying to prevent our delivery of information to U.S. authorities," he said. "These are not the actions of an institution flouting U.S. law enforcement or hiding behind Swiss law." Since the U.S. crackdown on tax evasion, Switzerland's private banks have suffered outflows of funds from clients in western Europe. In addition to the tax evasion issue, the Senate report also raised questions about the way Credit Suisse recognized new inflows of money into its private bank in 2012, which it said bolstered the private bank's financial performance. Credit Suisse said it had launched an internal probe into how so-called net new assets are recognized to ensure compliance with Swiss rules and its own internal policy. It said it was inaccurate to suggest that management and accountants at Credit Suisse did not follow company policy on recognizing such assets.